The Mirò Quartet is consistently praised for their deeply musical interpretations, exciting performances, and thoughtful programming. 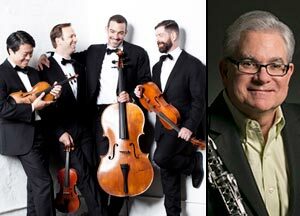 Concert highlights of recent seasons include a sold out return to Carnegie Hall to perform Beethoven’s complete Opus 59 Quartets. The Mirò took first prizes at several national and international competitions including the Banff International String Quartet Competition and the Naumburg Chamber Music Competition. They are currently based in Austin, Texas where they are Quartet in Residence at the University of Texas and serve on the faculty at the Butler School of Music. Clarinetist Steven Cohen is an Associate Professor at Northwestern’s Bienen School of Music and plays principal clarinet with Music of the Baroque. For many years Cohen was principal clarinet with the New Orleans Symphony. He maintains an active yearly solo, chamber music, and master class schedule in the U.S. and around the world. With this concert we end the 83rd season of the Chicago Chamber Music Society. The scope of the music we have heard this year has been broad indeed, and the timeline below shows what a wide range it has been: our first composer (Mozart) was born in 1756 and our most recent composer (Khachaturian), died in 1978, a span of 222 years in all. The music itself was written over nearly 150 years, some experimental for the period but now familiar (after all, Beethoven was revolutionary in his own time), some conservative and traditional. This season, we heard twice from two towering giants, Mozart and Ravel, pillars at either end of the musical spectrum. For this concert, we are thrilled and honored to present program notes that were offered, researched, and written by the musicians themselves. Two of the most important works for clarinet and string quartet are the Mozart and Brahms quintets. In each case the composer had in mind not a commission but, rather, a particular player. In the case of the Brahms quintet, it was Richard Muhlfeld. In fact, Brahms was ready to quit composing after his G-major string quintet, Op. 111, but after hearing Muhlfeld play, he was quite taken and said this was the best wind player he had ever heard. Brahms would end up spending hours with Muhlfeld, learning the idiosyncrasies of the clarinet. When all was said and done, he had composed a trio, this quintet and then subsequently two sonatas—quite a feat for someone who almost quit and threw his manuscript paper into the river! This is a work that is “autumnal” in nature. It is a gentle work, mostly, and it can be said that one must have experienced life in order to perform it. Only during the Adagio is there a diversion away from the gentle nature and on to a gypsy-like rhapsody, and then back to the gentleness. Listening to or performing this music takes one on an incredible journey; a journey of great beauty, deep introspection, yearning, and melancholy. A performance of this quartet may be heard on this YouTube clip (click here) by the Amadeus Quartet, a notable ensemble whose interesting history is given here. Though Beethoven planned to follow the Opus 74 of 1809 with a least one other quartet to form a set (sketches for a never-written C Major quartet exist), life, full of publishers and business as usual, got in his way, and it wasn’t until more than a year later, in 1810, that he settled down seriously to write his next quartet, the Opus 95 in F minor, a piece which stands all on its own within the Beethoven Quartet Cycle. The Opus 95 quartet, subtitled “Serioso,” is one of the best known of all Beethoven’s quartets, and truly it encapsulates the stereotyped personality of his middle-aged years that we most associate with the composer today. Terse (it is one of the shortest quartets), shocking, angry, unpredictable, impetuous, and dramatic are all words that could describe the wild-haired man himself as well as this music. Gone is the tender dream world of Opus 74; in its place is taut raw emotion. Each movement is very short, almost compressed – so much coming through in such very little time. The drama of the first movement, the mystic song of the second, the heroic anger of the third and the pleading anxiety of the last all whirl by at breakneck speed. The fact that the last movement ends with some of the swiftest and most exhilarating music ever written for quartet seems in seconds to whisk the listener off his feet and into the air in a way only the middle-aged Master could accomplish. Beethoven was clear in his letters that Opus 95 was “written for a small circle of connoisseurs, and never meant to be heard by the general public.” Indeed, though complete, Beethoven did not even pursue publishing the work until several years later in 1816. Nonetheless, because of its special intensity, unique emotional moments, and its brevity, it has become one of his most popular Beethoven string quartets with audiences today. And it is always an exhilarating ride for us on stage! https://youtu.be/6qId6p0eilc, by the Miró Quartet themselves.